Recently we took a little trip Up North (East Yorkshire Coast to be exact) to check out a holiday village, Sand Le Mere, after it's recent £4 Million makeover. I have to say that when we were offered the opportunity I really had no idea quite how far up north we were going and quite how long it was going to take us to get there from south of the M25 - 8 hours including 2 service station stops! Admittedly the M25 and the M1 were being particularly nasty to us that day and we also drove through almost constant rain. I have to say had I realised what an arduous journey it was going to be then I would probably have passed on this chance especially as we were only going to be able to enjoy 2 full day times there. However we went, took my mother in law too and had an enjoyable time. On arrival we collected our keys from the bar (reception being closed at the hour we arrived) and we set off to find our home for the weekend. Isla had been asking are we nearly there yet from joining the M1 so it was good for us to actually be there and not have to answer that question 100 times. Noah was knackered and so we set about organising who was sleeping where. We'd been left a travel cot to put up and this is where my first piece of constructive criticism comes. I know that the staff aren't to know that we were going to arrive at an ungodly hour and it would have been nice had this have been set up. But also it didn't feel like there was room for the travel cot as the room with the double bed wouldn't house it and the other two rooms had two single beds - so we had to do a bit of DIY in one of the twin rooms and take one of the beds apart put the mattress in the double room and put the bed frame on it's side so that we could fit the cot in. This meant that Isla and Noah were in sleeping together. I feel that this is something that should have been set up before we arrived. 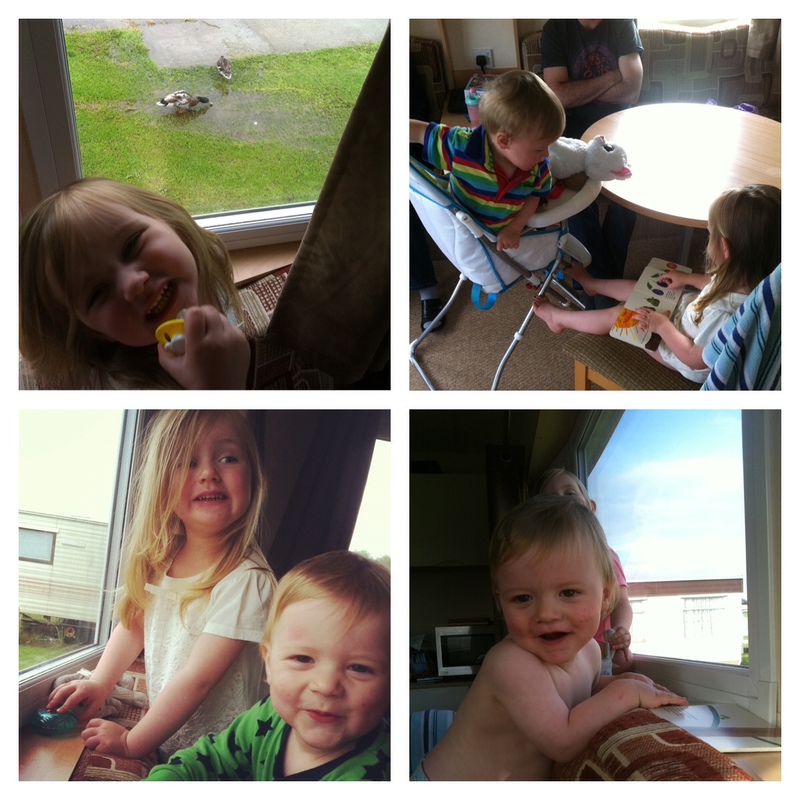 What we did discover from the weekend was that it can work having the kids in together - the first morning we were woken by their giggles which was really cute (even if it was 6.20am!). Once sleeping arrangements were sorted out, we got the kids ready for bed, got them down and then listened to the beeping from a smoke alarm. Low battery. No ones fault as such, batteries run down and I don't know when the last person would have been in the mobile home before us, but we didn't have a battery and it was too late to go in search of one so we went to bed with it intermittently beeping until the morning. I'm going to also add here that when you go and stay in a static caravan you can't possibly expect to have a lot of room and beds are half the size that they would be at home, so while me and the OH laid in our single beds listening to the smoke alarm beeping we had our feet hanging out the bedroom door (we are both 6 foot tall!) and our bottoms hanging over the side of the mattress - thought you might like to conjure up that image in your minds! In the morning, Isla was very excited about our temporary home, the night before she'd been massively excited when she saw a camp bed emerge from under a sofa in the lounge - actually looking in awe and uttering "That's amazing!". We had breakfast and then we got ready for a swim at the all new swimming pool. This was exciting for us as Noah hadn't been swimming as yet and we couldn't wait to see his reaction to it. When we got to the main building an adult swim was in progress but this was fine because there were an untold number of 2 penny slot machines (Isla loved 'winning' money) and an all new soft play area. I also went to reception to tell them about the need for a new battery for the smoke alarm and the bathroom light wasn't working. Both things were fixed while we were at the pool. Once the pool was open to all we dropped MIL at the cafe where she could watch us through the window, got ready and took to the pool. Isla was totally hyped, loving every minute of it. It's hard keeping up with her really - she's in and out of the pools (there are two - a small one with a slide and a main pool) and then in and out of the splash area. Noah on the other hand was a little bit shocked by his emergence into water and clung on for dear life but then after 5 minutes he relaxed and loved it! He had his Little Swimmers on that I'd kindly been sent to try and he looked so cute, he was laying on his back floating about - I wish I could have taken photos. The pool is the real attraction of the whole complex, it's so safe, the steps, floor and walls of the pool are soft and spongy, no hard tiles to contend with. It really is the star attraction! My only piece of constructive criticism here is that the showers need to have hooks nearby for people to hang their towels. A minor detail. After swimming we had lunch in the restaurant. The staff were really friendly, they heated up Noah's food and the food was tasty and pretty speedy. It also looked out on to the playground so adults could finish their food and watch the kids playing. The only thing I would have liked to see is the kids meals on the menu had an accompanying soft drink but they were all fizzy ones, a juice, fruit shoot or water is more appropriate for the really little ones. 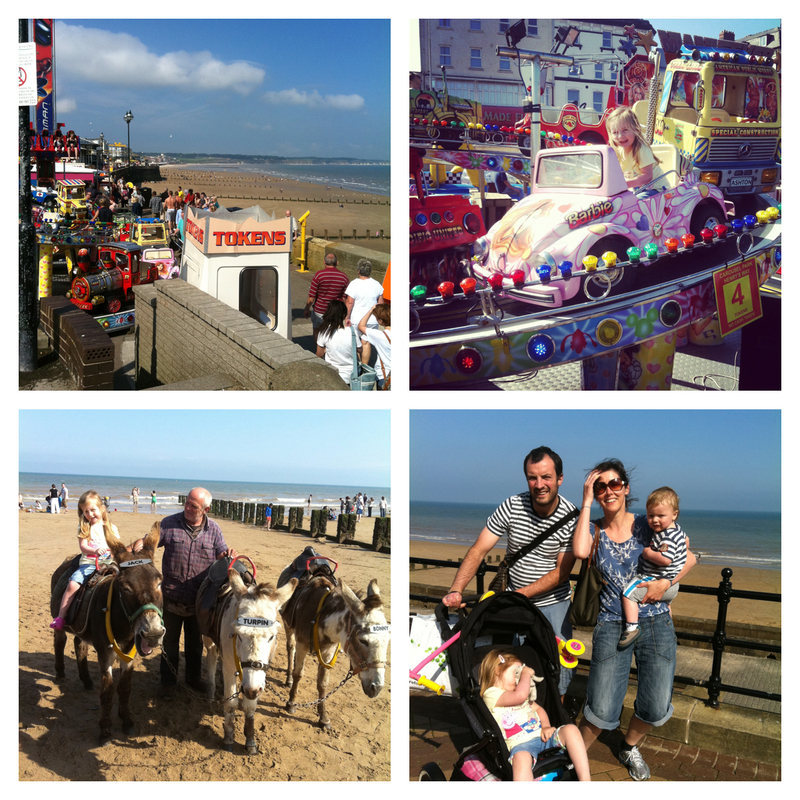 In the afternoon we took a 50 minute drive to Bridlington for a bit of seaside fun. 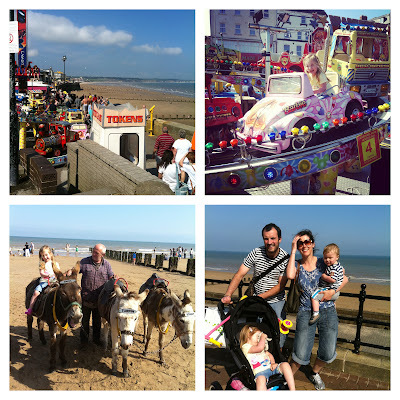 It was a really lovely sunny day and Isla had a top time, couple of rides at the fair, quick sandcastle session and a donkey ride. We had some tea there - lovely dressed crab for me. YUM. The following day we wanted to do the same as the day before in the morning, and take a trip to the pool. However when we pulled up in the car park we could see through the window that that there was no one in the pool. I ran in on my own to check out the situation and the pool was unexpectedly closed. There had been a power cut and this had lead to the pool losing water. As far as I know it was closed all day and this was a real blow as the kids loved the pool and had been promised swimming, so we kept our promise and made our way to the local pool at Withernsea. It wasn't as plush and new but it did the trick and we had a good time. On getting back to the van we had a little group of ducks outside our window and so the kids threw them a couple of slices of bread and it really entertained them. That night we cooked our first meal in the van. I would say that it's tricky cooking in such a small space with small toddling babies around but we managed. Isla loved mealtimes in there. I'd love to see things through child's eyes again as she found the whole thing so magical I think. The following morning we had breakfast and set off for home. So you see it was a short trip and my review is on the basis of a very short time spent at Sand Le Mere. We didn't experience the evening entertainment but we saw plenty of people with sleeping babies in buggies making their way there for some fun. There were just a few things that I've already pointed out that could have made our experience better but what I have to go by is how good a time did Isla have and I would say that she loved every minute of our time away. We were given free accommodation in exchange for this review. All opinions and words are my own.